"Of all the American people , the Quiché region of Guatemala have left us the richest mythological legacy. The story of creation, which appears in the Popol Vuh, which may be called the national book of the Quiché, in its rude and strange eloquence and poetic originality, is one of the most unique relics of indigenous thought". This is what reminds us the americanist Brancoft about a text that has become, over the time, the highest point, literarily and culturally speaking, about the knowledge of the ancient traditions, the history of the origins and history of the kings of the Quiché. 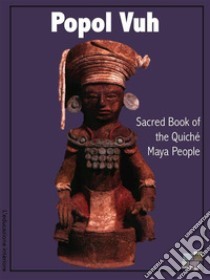 Descendants of the Maya, the Quiché represented the most powerful and cultured people and in this volume is given full value to their culture. A precious contribution to understand the myths and stories of a people that have been one of the most advanced culture of that historical period (the book was composed between 1554 and 1558 ). And for all of us it becomes current as, through myths and stories that seemed so far away, we can understand our cultural relativity, appreciating a writing which, although coming from the other side of the world, challenges us today. Photo gallery at the end of the ebook.